If you are an incarnate kite-surfer and living in the north, you might find it unbearable to get through the winter without getting on your board. But don’t worry; both the Bahamas and the Caribbean islands are within easy reach, and with consistent wind directions and many places to launch, they are both Paradise for enthusiastic kite-boarders. When you finally get down here you obviously want to get the most out of your time, so planning your kite-surfing vacation on a crewed yacht makes a lot of sense. You will have a crew who understand what it is all about, and utilizing their local knowledge, you can have them take you to the best spots….and stay overnight ready to launch at daybreak if you want to. Since the yacht is like a “Floating Boutique Hotel” you have accommodations, restaurant and rescue boat at your finger tips so you are not wasting time going back to shore. 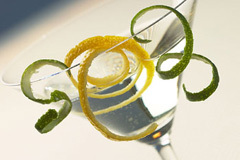 The Bahamas are only a one hour flight from Ft. Lauderdale and you can easily connect from other places as well. With more than 400 islands there is an endless array of beaches to launch from and new places to explore every day. In the winter you can easily have 30 knot winds when the cold fronts come through, but mostly you can expect 15 – 25 knots. If you are one of the lucky ones who can get away on short notice, you can just keep an eye on the weather forecast and plan according to that. The British Virgin Islands down in the Caribbean is another great destination for kiting and it also has many other things to offer like hiking, snorkeling and diving, which is great if you are spending your vacation with friends or family who prefer to spend their time, in another way. Anegada is the most popular place to kite, but there are several other places and in the protected waters of the North Sound, Virgin Gorda, there is a really good kite school whether you are trying kiting for the first time or want to learn some new tricks. 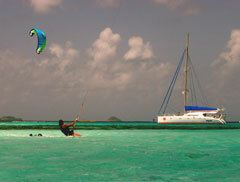 There are many other places for kite-surfing in the Caribbean, but The Grenadines is probably the best one. 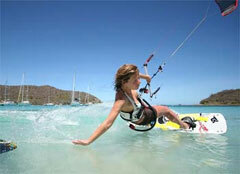 It is not crowded and there are great kitesurfing areas only a few miles apart so there are always new places to go. It is a great place for intermediate and advanced kitesurfers and offers protected flat waters, waves and endless downwinds which you will never forget. There are 32 beautiful islands, but the Tobago Cays, which is a National Park, takes the price. It is so breathtakingly beautiful that when I arrived the first time, I was convinced that this is where all the photos for Caribbean tourist brochures were taken. . . . . but come and see for yourself!